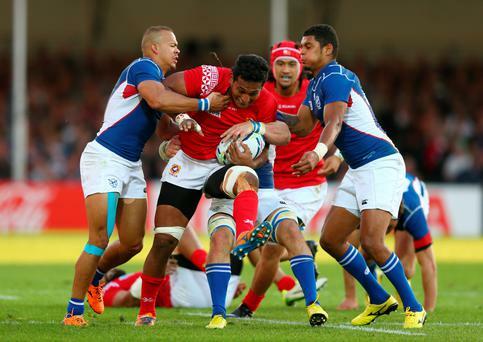 Tonga and Namibia players contest a line-out during the Rugby World Cup match at Sandy Park, Exeter. Namibia players sign their national anthem before the Rugby World Cup match at Sandy Park, Exeter. PRESS ASSOCIATION Photo. Picture date: Tuesday September 29, 2015. See PA story RUGBYU Tonga. Photo credit should read: David Davies/PA Wire. RESTRICTIONS: Editorial use only. Strictly no commercial use or association without RWCL permission. Still image use only. Use implies acceptance of Section 6 of RWC 2015 T&Cs at: http://bit.ly/1MPElTL Call +44 (0)1158 447447 for further info. Tonga players perform the Sipi Tau before the Rugby World Cup match at Sandy Park, Exeter. PRESS ASSOCIATION Photo. Picture date: Tuesday September 29, 2015. See PA story RUGBYU Tonga. Photo credit should read: David Davies/PA Wire. RESTRICTIONS: Editorial use only. Strictly no commercial use or association without RWCL permission. Still image use only. Use implies acceptance of Section 6 of RWC 2015 T&Cs at: http://bit.ly/1MPElTL Call +44 (0)1158 447447 for further info. A vendor hands out miniature flags for either Tonga or Nambia on the Sandy Park Pesestrian Bridge before the Rugby World Cup match at Sandy Park, Exeter. PRESS ASSOCIATION Photo. Picture date: Tuesday September 29, 2015. See PA story RUGBYU Tonga. Photo credit should read: David Davies/PA Wire. RESTRICTIONS: Editorial use only. Strictly no commercial use or association without RWCL permission. Still image use only. Use implies acceptance of Section 6 of RWC 2015 T&Cs at: http://bit.ly/1MPElTL Call +44 (0)1158 447447 for further info.